Unfortunately, damage to cartilage is not readily repaired by the body. That’s because cartilage unlike most tissues in the body doesn’t have its own blood supply to bathe damaged tissue and provide factors promoting regeneration. 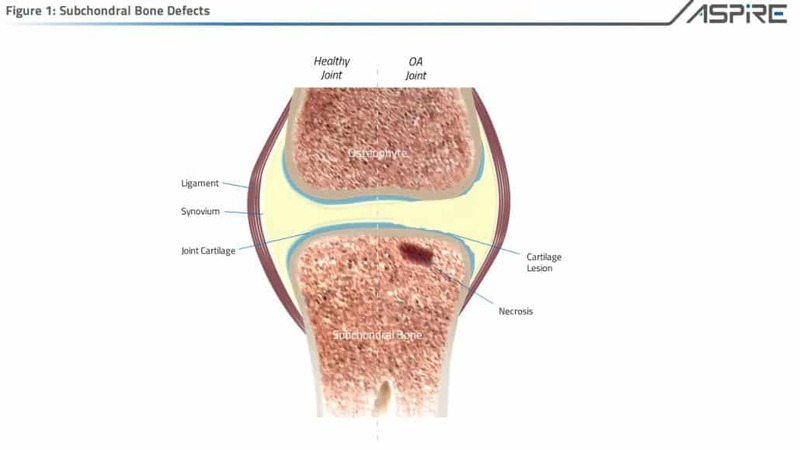 Treating cartilage and subchondral bone defects typically encompass both biologic as well as structural components. 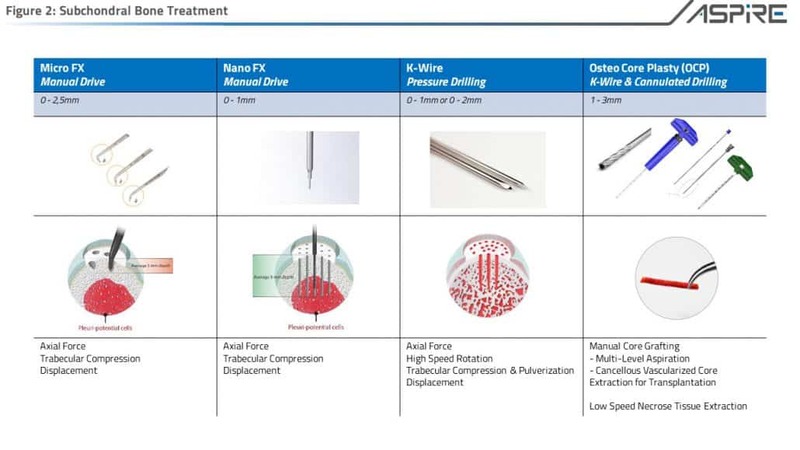 Biological aspects typically include: Marrow Stimulation efforts such as, K-Wire Drilling, Micro-Fracturing, Nano-Fracturing, Core Decompression or additive therapies such as autologous PRP Injections, Adipose derivations, and Bone Marrow Cell Injections. Subchondroplasty aspects range from Cement Injections, Allograft Transplantation, ACI Procedures, Bone Marrow Cell Graft Injections, Iliac Crest (Tibia) Bone Grafting options. 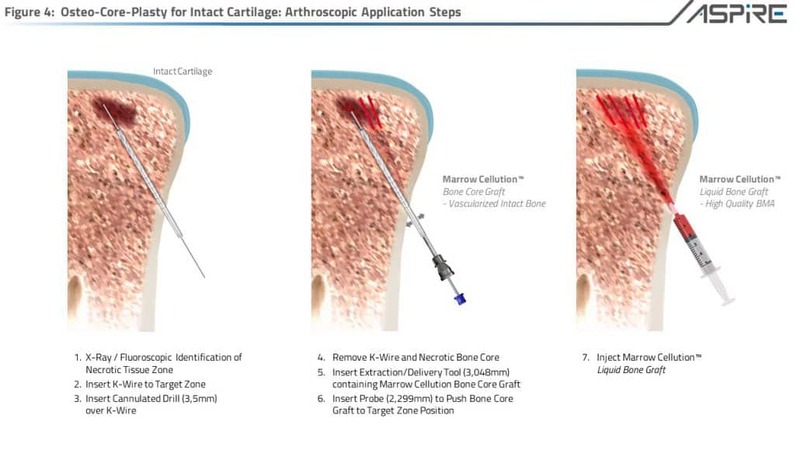 Osteo-Core-Plasty with Marrow Cellution provides both Biologic and Structural components to provide an optimized environment for regeneration. Bone remodelling is a dynamic process that involves a combination of an osteoconductive functional matrix, living cells that produce osteoinductive growth factors and osteogenetic cells that form new bone. Autograft is defined as bone tissue transferred from one site to another in the same individual. Autograft has traditionally been the gold standard in bone grafting because it is proven and predictable. Cells are harvested with the transplanted matrix structure. Cells can migrate within the transplanted matrix from the peripheral blood infrastructure. Cells can mobilize from the marrow space and home to the transplanted matrix (i.e. vasculogenesis) drive osteoinduction and osteogenesis. Commonly employed types of autograft are derived from the Iliac crest and Tibial plateau. Bones are dynamic, viable, highly organized living tissue. Autologous cancellous bone pieces are osteoconductive, osteoinductive and osteogenic. 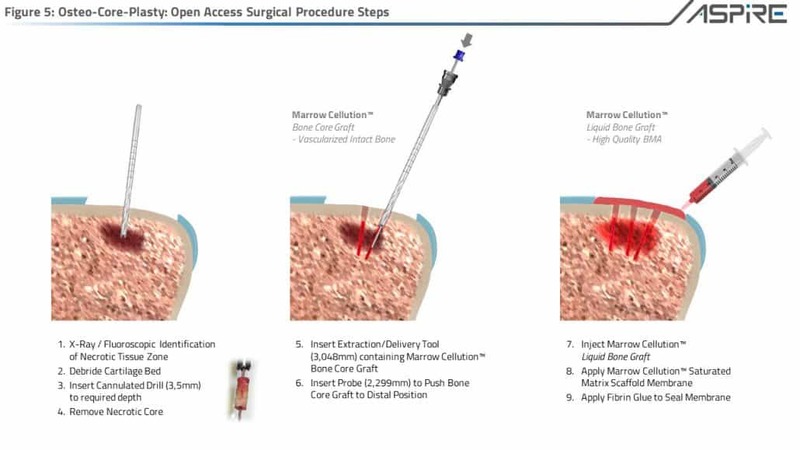 Traditional harvesting of autograft typically requires a soft tissue cut down technique and creation of a fenestration of the cortical bone complex to gain access to the cancellous marrow cavity. This open process of collecting small pieces of cancellous bone dramatically increases pain and morbidity for the patient as well as, disrupts the highly organized structure and supporting microvasculature of bone. Vascularized and cancellous autograft show optimal skeletal incorporation but are limited by morbidity concerns. 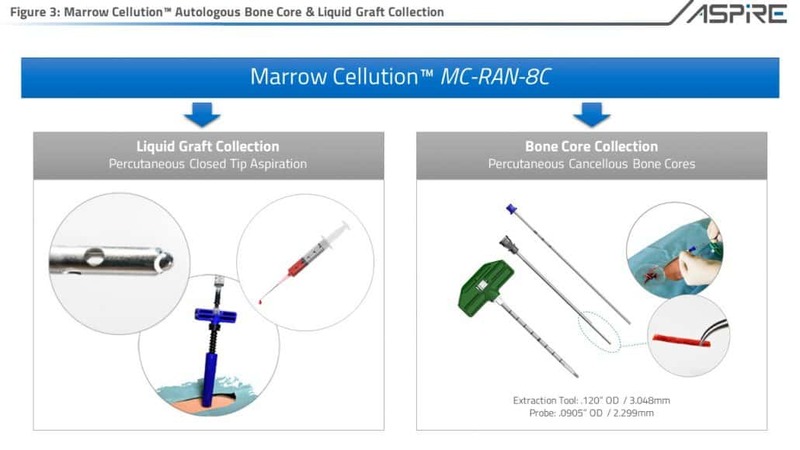 (4) The percutaneous utilization of the Marrow Cellution graft delivery syringe and the Marrow Cellution Bone Dowel Harvest device, the clinician can create a combination graft of a vascularized intact bone dowel in the center of the graft surrounded by allogeneic, autologous or synthetic bone chips hydrated with marrow aspirate. The Marrow Cellution™ Osteo-Core-Plasty is a X-Ray or fluoroscopic, minimally invasive, autologous, biologic procedure that allows for necrotic bone segment resection and transplants living, vital, intact bone core segments that have the capacity to reincorporate naturally without foreign body implantation. (1) Frieri M, et al. Wounds, burns, trauma, and injury. Wound Medicine, 13 (2016) 12-17. (2) Ostrup LT, et al. Distant transfer of a free, living bone graft by micro-vascular anastomoses. An experimental study. Plast Reconstr Surg. 1974 Sep; 54(3): 274-85. (3) Taylor GI, et al. The free vascularized bone graft. A clinical extension of microvascular techniques. Plast Reconstr Surg. 1975 May;55(5):533-44. (4) Bauer TW, et al. Bone graft materials. An overview of the basic science. Clin Orthop Relat Res. 2000 Feb;(371):10-27.